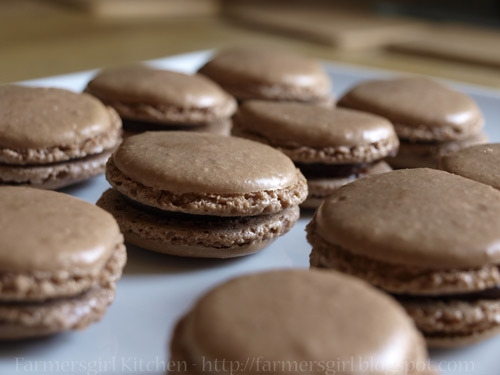 Farmersgirl Kitchen: The Great Macaron Challenge! When I saw that the 'We should Cocoa' blog challenge was to combine chocolate and almonds, I knew that it was time to overcome my fear and make chocolate macarons! I decided to tweet my intention just to make sure I didn't back out and Sue, from A little bit of heaven on a plate, tweeted right back that she would make them if I would! And so the Great Macaron Challenge had begun. I am fortunate enough to own a copy of 'Mad about Macarons!' 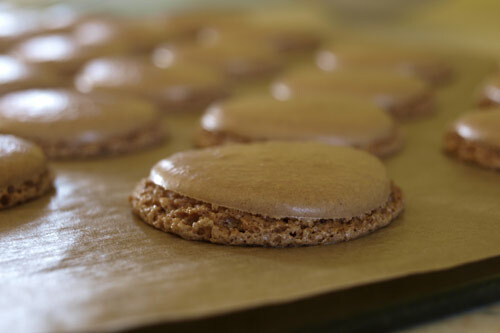 by Jill Colonna and used the technique and recipe in there for the Dark Chocolate Macarons. Everything was very precise and very clearly explained with text and step-by-step photographs. 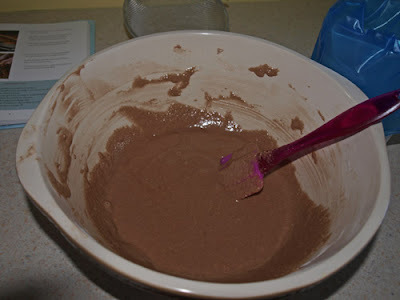 This is the mixture or macaronnage with all the air pushed out of the beaten egg whites and the ground almonds, cocoa and icing sugar. The mixture was then piped onto baking sheets covered with baking paper. If I'm going to be making many of these I will invest in a macaron mat to make it easy to make them all the same size. Yes, they are rather flat (more practice required) but at least there is an obvious 'foot' which pleased me no end. The filling is a chocolate/coffee ganache, and I was pleased that when they were put together, the macarons looked more like they should. 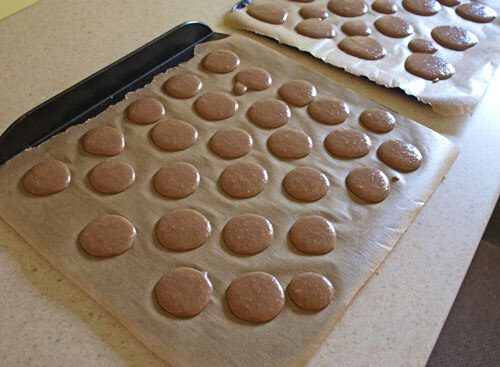 Sadly, Sue's macarons did not work out, not even enough to show on her blog. I hope she will have another go, I definitely will be making more. We should Cocoa is being hosted this month by Laura at How to Cook Good Food full details of the challenge are available on Choclette's Chocolate Log Blog the other founding member of this challenge is Chele at Chocolate Teapot who is taking a bit of a break just now. Can't believe those are your first attempt Janice, they look amazing. Very well done you. Thanks for a great contribution to WSC. I am so impressed with your first attempt Janice, and not surprised that you will be making more! So would I if they turned out as well as yours. 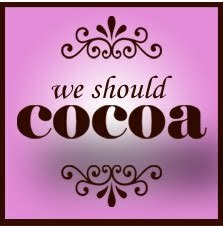 This is such a good entry for We Should Cocoa. Thanks so much and i hope you enjoyed the challenge greatly! Janice, your macarons are wonderful. Bravo! Thanks for the shout-out. Doing the macaron dance with you. There's no stopping you now - sounds like you'll be hooked! Oh well done! My macarons never work out that well. I have pretty much given up on them but now I've seen yours I'm wondering if I'm just making them too big. lovely - well done they are great for a first attempt. 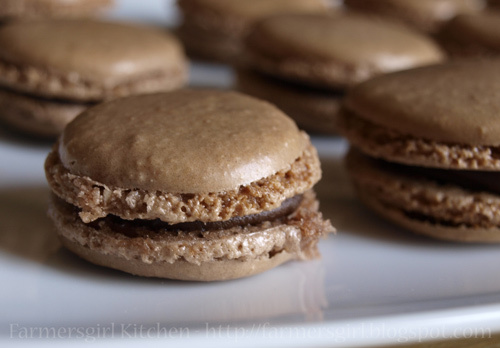 I find the macaronage step the hardest to get right and mine end up to full of air these days. Must try harder I guess! Bravo! They look amazing! We'll see you joining in with Mactweets.blogspot.com yet! They look wonderful Janice. I could happily tuck in right now!